It has been suggested that Hernandez throw his curveball more and he's willing to try it. PEORIA, Ariz. — Felix Hernandez said something somewhat unexpected in the media session after his three-inning start Thursday. Hernandez has rarely made such an acknowledgment during his time with the Mariners, particularly about data. While he looks at game plans and tendencies, he often goes by feel and what is working best that day. He’s also been steadfast in his belief his change-up is his best pitch, which it has been for many years. But in this spring’s individual pitcher meetings, manager Scott Servais and pitching coach Paul Davis showed Hernandez his success rate with the curveball versus his other pitches. Per Brooks Baseball and its data based on Pitchf/x readings from last season, hitters have batted .205 with a .359 slugging percentage against his curveball, which he used 27.55 percent of the time, while posting a .327 batting average and .574 slugging percentage against his sinker, which was thrown 33.01 percent of the time. His change-up generated a .227 batting average and .357 slugging percentage in 24.07 percent usage. The curveball usage is the highest of his career, and it could increase this season. In terms of swings and misses, Hernandez generated 14.75 percent on his change-up, 11.05 percent on his curveball and around 5 percent or lower on his four-seam fastball and sinker. Hernandez was presented these numbers and a possible shift in thinking. Hernandez knows in his final season before free agency and coming off the worst season of his career, a bounce-back year is needed if he hopes to continue pitching at the MLB level. So embracing something new is logical. It’s a matter of whether he sticks with the concept even when results aren’t exactly to his liking, or will he revert to his old way of pitching. 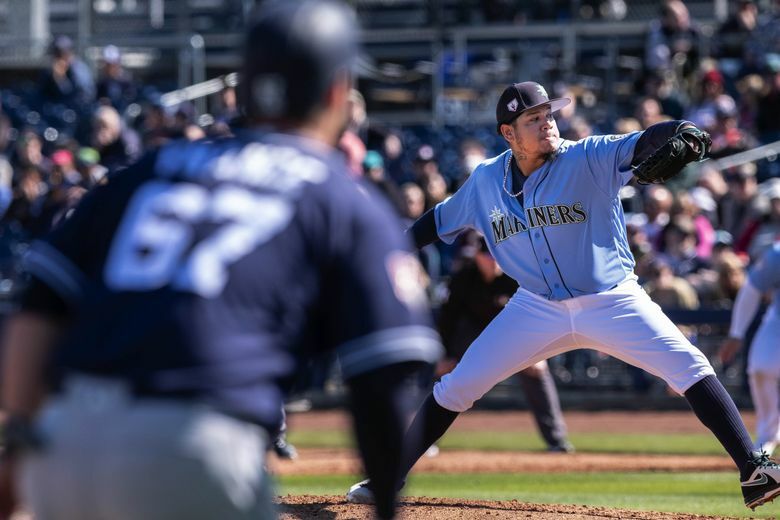 With days dwindling down before they depart for Japan and Cactus League games becoming more limited, the Mariners scheduled two “B” games with teams from the Korean Baseball Organization, who are in Arizona for their own spring-training workouts. On Friday, the Mariners played a nine-inning “B” game against the NC Dinos of the KBO, rolling to a 9-2 victory. Seattle started lefty Wade LeBlanc, who pitched three shutout innings, allowing three hits with a strikeout. Facing pitching that might be considered Class AAA level at best, the Mariners banged out 12 hits. Ryon Healy, who had been nursing a tight hamstring, had two hits, including a three-run homer. Kyle Lewis continues to have a big spring, smashing a towering solo homer. He has hit a homer in three out of the four games he has played in this spring. There was also some excitement for fans on the back field as talented young outfield prospects Jarred Kelenic (No. 2 overall in the organization) and Julio Rodriguez (No. 4) played in the later innings. Kelenic singled sharply to right in his first at-bat but was then picked off at first base with Rodriguez at the plate. Rodriguez hammered a hard one-hopper up the middle that seemed like a sure hit but the Dinos’ second baseman made a brilliant diving play and throw to first to rob him. In Kelenic’s second at-bat, he laced a ball into the right field corner and showed his plus speed, racing around the bases for a triple. Rodriguez never got a second at-bat in the game, but he got a single in his first career Cactus League at-bat in Thursday’s game. With relievers starting to throw more regularly in Cactus League games, the Mariners made their first cuts from major-league camp on Friday afternoon to cull the number of pitchers. Seattle optioned right-handed reliever Ruben Alaniz to Class AAA Tacoma and lefty reliever Ricardo Sanchez to Class AA Arkansas. Right-handers Jack Anderson and Max Povse were both reassigned to minor-league camp since they are not on the 40-man roster. Alaniz had pitched one inning in Cactus League play and pitched in Friday’s B game. Sanchez also had one appearance of one scoreless inning. Anderson, a submarine-style pitcher, was in camp because he won the Mariners’ “60 feet, 6 inches award,” which goes to the pitcher that best embraces the Mariners’ “Control the Zone” philosophy of dominating 0-0 and 1-1 counts. He had one appearance, allowing a run on two hits. Povse has been dealing with shoulder issues all spring and has yet to appear in a game. He was scheduled to begin throwing bullpen sessions in the next week.